A 600 m2 organic rooftop garden, five floors above an old car auction – it sounds like a scene from New York, but it is totally Copenhagen. Here in Østerbro, the ØsterGro project, comprising 90 tonnes of soil spread over neat raised beds, is just one example of how urban gardens are turning Copenhagen roofs into lush urban agriculture. One of the first roof gardens appeared three years ago on top of a shed in a Nørrebro backyard. What became known as the ‘Roof Tomato’ project has since spread like wildfire – today, it involves up to a thousand families who grow their own vegetables and flowers in self-watering ‘capillary boxes’ that don’t require daily care, and can be placed on vacant backyard roofs, balconies, in sidewalk gardens or sunny squares. ‘I have worked as an urban planner, where you talk a lot about breaking down social barriers. And that’s exactly what happens when you build a plant box together then share in the care of it. 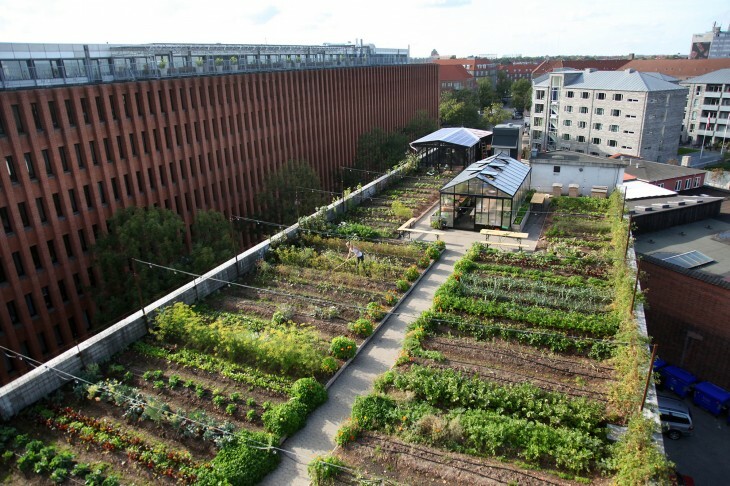 The fact that the city also becomes greener is just a positive side effect,’ says Mads Boserup Lauritsen, initiator of the Roof Tomato project. He took an entire year off to run workshops for local citizens and teach them how to make their own small gardens. The urban gardens have spread through Copenhagen’s downtown areas at record speed. Blågårds School in Nørrebro has a small roof garden called DYRK Nørrebro. But with 90 tonnes of soil on the large roof in Æbeløgade, ØsterGro has expanded the concept into a real urban roof farm, which will not only have plenty of vegetables, but also urban bees and chickens to produce honey and eggs for the association’s 17 members (so far). ‘We are not labouring under any illusion that the people of Copenhagen will somehow become self-sufficient from urban gardens and agriculture, but we want to serve as a link between Copenhagen and organic agriculture for the city, inspire local organic markets and disseminate knowledge about food – whether it comes from rooftops or the countryside,’ said Livia Urban Swart Haaland, one of the team behind ØsterGro. ØsterGro was inspired by the Brooklyn Grange rooftop garden farm in New York, which was established in 2010 on top of an old film studio in Brooklyn, overlooking the Manhattan skyline. The term ‘capillary’ is a physiological one, and refers to a small blood vessel that runs along an organism’s cells and carries nutrients. In plants, capillaries are the microscopic channels through which water makes its way from the roots to the leaves. A capillary box has a base filled with water, which slowly migrates up through the soil to the plants. The Roof Tomato project includes workshops on how to make your own capillary box, which will provide plants with water for 7–14 days. Lots of vegetables, bees and chickens. There is a freight elevator up to the roof garden.